Record and stream with unparalleled sound quality direct to your computer with Blue’s Yeti USB Microphone. Yeti uses Blue’s proprietary tri-capsule technology to produce pristine, studio-quality recordings. 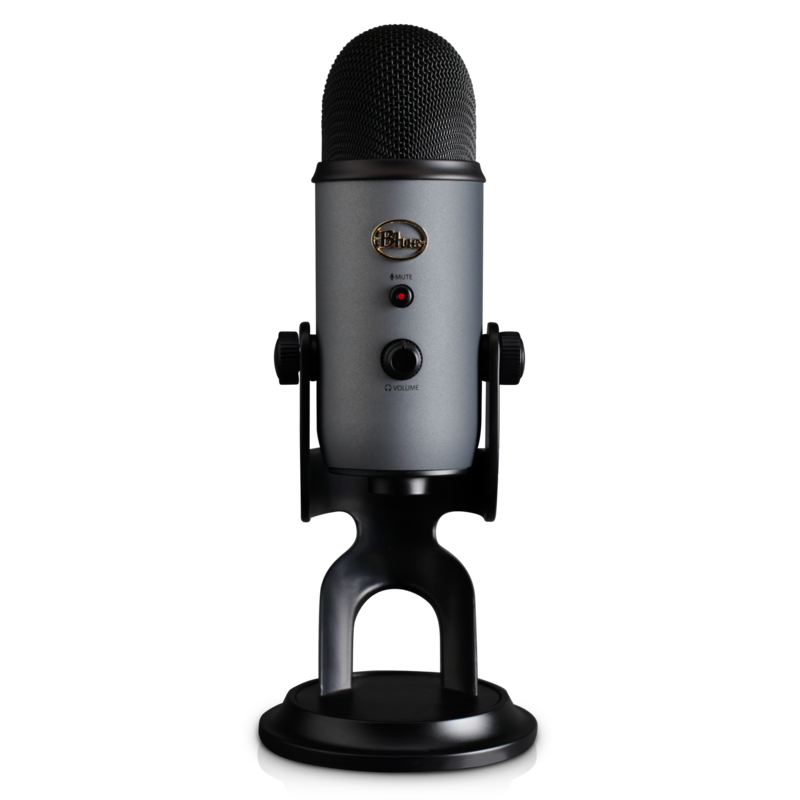 Featuring four different pattern settings, Yeti is the #1 USB mic for podcasts, voice-overs for YouTube™, game streaming on Twitch™, skype™ calls, music and more. With simple controls for headphone volume, pattern selection, instant mute, and microphone gain, you'll be recording and streaming right out of the box. Cardioid mode: Well-suited to podcasts, game streaming, vocals, and instruments, cardioid mode records sound sources that are directly in front of the microphone. It delivers a rich, full-bodied sound. Stereo mode: The stereo mode uses both the left and right channels, and is ideal for capturing a realistic sound image when there are multiple sound sources in front of the mic. Bidirectional mode: Bidirectional mode records from both the front and the rear of the microphone. It is ideal for recording an interview between two people. Omnidirectional mode: Omnidirectional mode picks up sound equally from all directions. It is best used in situations when you want to capture the ambience of "being there" - like a live recording of a band's performance. With its controls for headphone volume, pattern selection, instant mute, and microphone gain, the Yeti puts you in charge of every level of the recording process. If you are experiencing distortion or feedback while recording an especially loud source, simply adjust the microphone's sensitivity with the gain control. Or, if you want to take a break in the middle of a podcast, use the instant mute button. The microphone comes equipped with a 3.5-millimeter headphone jack and allows you to listen to what you're recording in real-time, without latency delays. You can adjust the volume of your headphones using a control on the front of the microphone. The Yeti features a visual design inspired by classic recording equipment--a stylish, retro aesthetic that will complement any computer system. Its metal grille and shiny frame recall the look of old-timey microphones. Because it's built on a hinge, you can adjust and pivot the microphone in relation to the sound source, improving sound quality. Once you have it at a desired angle, you can use the set screws to secure it in place. The microphone can also be folded down for easy portability, or removed completely from its base for field recordings. The Yeti requires no complicated drivers to operate; simply plug it into your computer's USB port with the included USB cable, calibrate it with your operating system, and you're ready to record.